This 10-day exploration of Argentina showcased famous natural wonders such as Iguazu Falls but also lesser known locations just as magnificent. From Iguazu, venture to the wetlands of Iberia to have a unique experience at Puerto Valle. From there, head south to the eastern coast to Puerto Madryn to witness the rugged coastline and the cute inhabitants that call this area home, Penguins! After breakfast at your hotel this morning, you will embark on a full day private tour of the Argentinean side of the waterfalls. Enjoy the 275 cascades in all of its splendor, as viewed from various access points. The footbridges and the navigation tours will take you closer and closer to the waterfalls, in order to get the most out of this unforgettable experience. Your expedition will begin at the Visitors Center, before continuing through the many wonders of the Argentinean waterfalls. This exploration will include the lower circuit, which approaches the dense Jungle; while the 1,000-meter footbridge will lead to the impressive Garganta del Diablo. Welcome to the Ibera Wetlands! Puerto Valle Hotel offers its guests exclusive access to the rich biodiversity of the largest conservation area in Argentina. The heart of the hotel – a singular and graceful mixture of refinement, history, nature and people— is a traditional manor of Corrientes built in 1868, with stately and comfortable rooms. A magnificent park of more than 14 hectares, meticulously designed by the prestigious landscaping firm of Carlos Thays, is home to native and exotic species, and invites guests to relax and enjoy the quiet and the connection with nature. 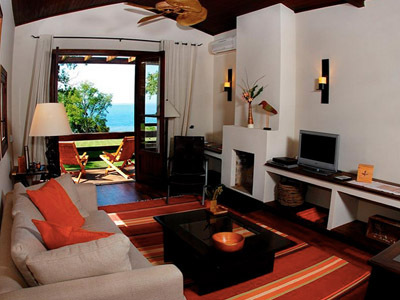 Your all inclusive stay at Puerto Valle Hotel will be unlike anything you have ever experienced. On property, the natural landscape takes center stage. 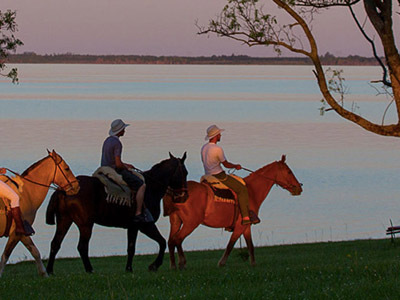 The hotel is surrounded by a unique geography of the northern Corrientes Province, and offers exclusive access to the rich biodiversity of the Ibera Natural Reserve. The area surrounding the hotel features lakes, marshlands, wetlands and floating soil formations, against the backdrop of the native forests and the Parana River. The Estancia engages in a series of productive steps following sustainability criteria, and guests have a diverse menu of activities to choose from. There are plenty of excursions for every traveler. Hiking, bird watching, fishing and horseback riding are some of the numerous outings you can enjoy in couples or with friends and family. Each of the programs have been carefully designed to offer you the opportunity to see, experience and connect with the environment, no matter what your preferences and interests are. Puerto Madryn is the main town in the Peninsula Valdes region, located in the southern portion of Argentina's coast. To the south, you will find the Penguins Reserve of Punta Tombo and other highlights in the area include whale watching, visiting the sea lions, as well as observing the penguins. The marine life sightings in this area are endless, so keep your eyes in and around the water for the action. This morning, you will embark on a full day guided tour of the Peninsula de Valdes & Delgada or Punta Norte. Peninsula Valdes in Patagonia is a site of global significance for the conservation of marine mammals. 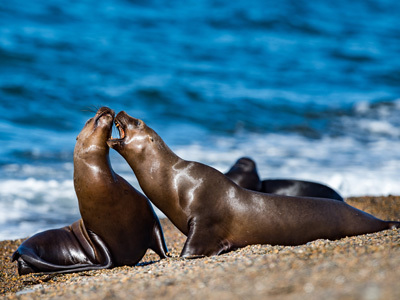 It is home to an important breeding population of the endangered southern right whale, as well as important breeding populations of southern elephant seals and southern sea lions. The orcas in this area have developed a unique hunting strategy to adapt to local coastal conditions. Penguins can also be seen here as well. To begin the tour, you will be met at your hotel by your guide, from where you will head northeast by national route Nº 3, then by provincial routes 1 and 2 , eventually arriving at Carlos Ameghino’s Interpretative Bureau. This is the first point of your excursion, where it is possible to see part of the history, local fauna and sea birds of this area. From there, you will continue on to Caleta Valdes or Punta Norte, a continental sea elephants reserve. During the journey, you will see the natural inhabitants of the Peninsula Valdes, including, American ostriches, Patagonian hares, armadillos, foxes, skunks, eagles, Patagonian owls, and many others! Sadly, your journey must come to an end today. However, you will be leaving with unforgettable memories and the experience of a lifetime! After checking out of your hotel in Puerto Madryn, you will be met by your driver and transferred to the airport in good time to board your domestic flight to Buenos Aires. On arrival, check into your international departure flight home. La Cantera Jungle Lodge was carefully built to preserve the surrounding environment and create the least impact possible. Amidst the property's 3 hectares of grounds, you can discover a beautifully protected display of endangered species of trees, some over 400 years old! At this jungle retreat, sophistication and nature blend harmoniously together. Listen to the sounds of the wild as you fall asleep at night and spend your days exploring the impressive diversity of flora and fauna. La Cantera Jungle Lodge is the perfect hideaway to call home, as you enjoy and experience Iguazu and the lush jungle rainforest. Exploring the Patagonia region can make for very intense days. Enjoy the comfort of modern amenities between touring the desert landscapes or navigating with the whales. 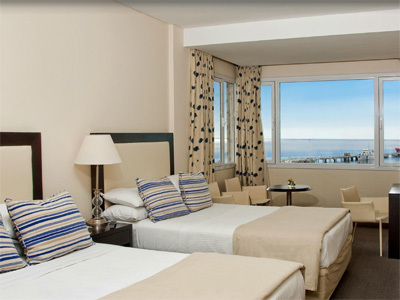 Thelovely Península Valdes Hotel, located in Puerto Madryn, overlooks the calm waters of Golfo Nuevo, for the perfect peaceful retreat. Escape the histle and bustle, with a coastal getaway in a clean, welcoming and accommodating space. The staff on property offer the highest level of hospitable service and not a single detail goes unnoticed.